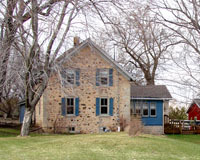 The current Weidman Farmhouse replaced the family’s original 1852 log cabin and was constructed by their son, Lorenz John Weidman and his wife. The 1894 structure was built of split quarry stone, which was hauled by horse-drawn wagons from Rockfield about ten miles away. A summer kitchen built of field stones was added in 1907. Known as the Stony Knoll Farm, this warm and inviting farmhouse, built in 1894, was once the Juedes Family Homestead. The original 2-room structure built in 1849 was constructed of hand-hewn 8” x 12” oak timbers milled in one of Cedarburg’s first mills. Edward and Johanna Blank purchased the Fischer House in 1854; the first of several generations of this family to inhabit the home. In 1864, German stone masons built a split-quarry limestone wing which nearly doubled the size of the house. The second generation, known as the Kuhefuss Family, remodeled the house over a period of several years from the late 1920’s through the 1950’s. 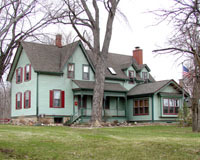 Marie Kuhefuss, a founding member of the Cedarburg Cultural Center, generously bequeathed the home to the Center in 1989. 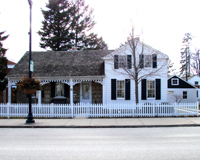 Major restoration work was completed in 1990.
was home to Cedarburg’s beloved first physician, Dr. Theodore Hartwig and his family. The house has a floor plan which included a waiting area and office for Dr. Hartwig’s medical practice.